Audi Chairman Rupert Stadler introduces the A4-based h-tron Quattro concept this week in Detroit. 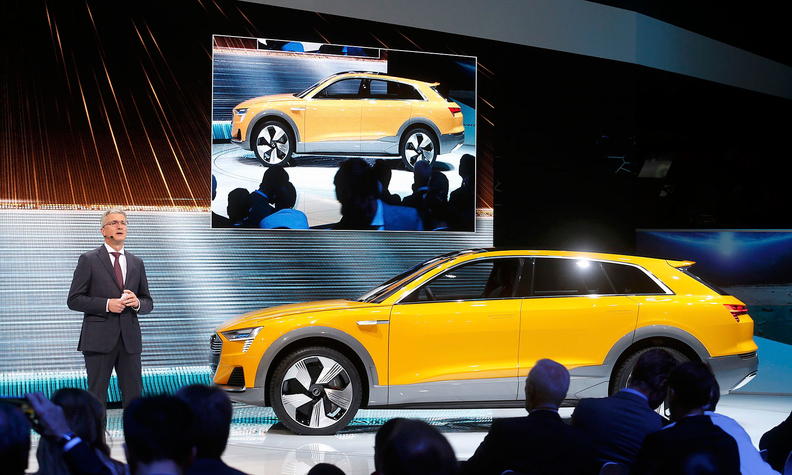 German luxury automakers, feeling the heat from more mainstream rivals offering smartphone connectivity and advanced driver assistance systems, are beefing up their digital expertise. DETROIT (Reuters) -- Software expertise has become the new battleground for upscale automakers as the latest premium cars compete on high-tech innovations rather than sheer power or luxury, something that requires millions of lines of code. Mercedes has been hiring staff in Sunnyvale, California, -- not far from the headquarters of Internet leaders Alphabet and Yahoo -- while rival Audi, the premium brand owned by Volkswagen, said it plans to add software engineers. Most notably, BMW has created a 200-strong digital innovation hub in Chicago, hiring software engineers who worked for mobile phone pioneer Nokia, as the German carmaker seeks to get ahead in the area of assistance systems and software applications. "Their task is to develop a premium experience in the digital area and in mobility services," BMW board member Ian Robertson told Reuters at the Detroit auto show. The German luxury automakers are feeling the heat from more mainstream rivals offering smartphone connectivity and advanced driver assistance systems like automated braking and sophisticated cruise control in their most basic models. At the same time, anti-pollution rules are forcing them to abandon their traditional tactic of offering cars with more horsepower and a higher number of cylinders. Without beefing up digital expertise, German automakers will struggle to offer new premium features such as autonomous driving and car-sharing services to compete with new rivals such as Alphabet -- formerly known as Google -- and Uber . Ford Motor Co. and General Motors are also planning advanced semi-autonomous driving functions. "Younger customers demand the latest connectivity features, and German premium automakers need to develop new offerings in the digital arena which cater to this," said Thilo Koslowski, vice president of the automotive practice at technology market research firm Gartner. BMW's Chicago team helped to develop 'Bumper Detect' a new system unveiled last week which uses BMW's onboard camera and sensors to photograph potential thieves or vandals. "The car can take photographs of another vehicle which may have left a dent in your parked car, and send pictures to your mobile device," Robertson said. The Bavarian automaker already has several software development centers in Munich and elsewhere and said it will continue to recruit staff in 2016 to help "the advancement of new technologies, including the ever-increasing scale of digitalization." The team of 200 staff in Chicago, based on a nucleus of engineers who left Nokia's handset unit after it was bought by Microsoft Corp. in 2014, has been assembled over the past 18 months. It is the latest example of a traditional metal-bashing carmaker hiring mobile phone and software expertise. It is housed in the same building as HERE, the high-definition mapping business recently acquired by BMW, Volkswagen unit Audi and Daimler from Finland's Nokia in December. It is not far from Continental's infotainment and connectivity unit based Deer Park, Ill., to the northwest of Chicago. Continental hired hundreds of software engineers there when it bought Motorola's automotive technology business in 2006.